We are constantly looking for the best commercial cooking equipment to provide to our customers. We recognise how important it is that the equipment you use is not only good for cooking, but it also must have longevity and be reliable. There are some important aspects of selecting a commercial deep fryer that will meet the demanding requirements of a busy kitchen. It needs to be professionally designed and well made so that it is able to handle the general wear and tear of the cooking environment as well as limit the impact of any potential corrosion caused by cleaning processes. There is an expectation that it will have a good frying area, high energy efficiency, quick response and recovery, and cooking flexibility. In addition, it needs to be designed to provide ease of access for cooking, a practical draining set up, and it should be able to be quickly and easily cleaned. If you are looking for the best commercial gas deep fryer for sale, then you should bespeaking with the personnel at Clem Tech. When cooking with oil it is important to be able to select the right temperature and be confident that the oil will remain consistently at that temperature during cooking. The thermostat must be reliable and able to withstand regular cleaning without being affected. Having a solid structure that helps retain the heat also adds to the efficiency of the equipment. Selecting a fryer that is the right size is important as well. You do not want to have a fryer that is too large for your needs, but you also must ensure that you select one that will produce the best results for your fried menu items. If you are looking for the best commercial deep fryer Melbourne has to offer, then call us today. There are many commercial deep fryer styles and manufacturers to choose from. 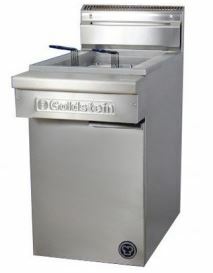 Commercial gas deep fryers are known as being very effective although they do require some additional installation work. We have undertaken detailed research to identify equipment that can be relied on. Contact Clem Tech by calling (03) 9338 3071 today to speak to our experienced and knowledgeable staff to help you in choosing the best commercial deep fryer to meet your specific requirements.